U.S. equity index futures were lower this morning. S&P 500 futures were down 10 points in pre-opening trade. U.S. equity indices moved lower following release of the August Employment Report at 8:30 AM EDT. Consensus for August Non-Farm Payrolls was an increase to 187,000 from 157,000 in July. Actual was 201,000. Consensus for August Unemployment Rate was a drop to 3.8% from 3.9% in July. 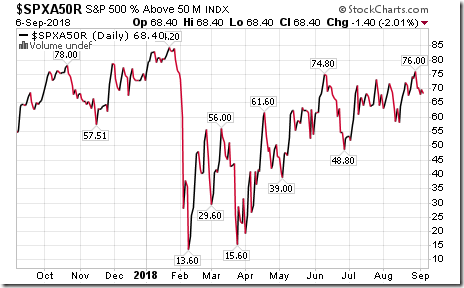 Actual was unchanged at 3.9%. Consensus for August Hourly Earnings was an increase of 0.2% versus a gain of 0.3% in July. Actual was an increase of 0.4%. 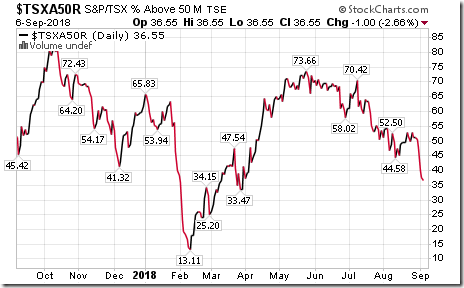 The Canadian Dollar dropped 0.34 to U.S. 75.93 cents following release of the August Canadian Employment report. Consensus was an increase in August employment by 5,000 versus a gain of 54,100 in July. Actual was a drop of 51,500. Consensus for the August unemployment rate was an increase to 5.9% from 5.8% in July. Actual was an increase to 6.0%. 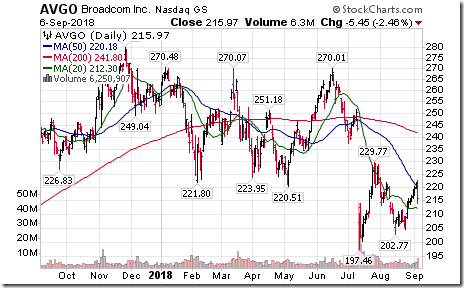 Broadcom gained $10.98 to $226.92 after reporting higher than consensus fiscal third quarter results. 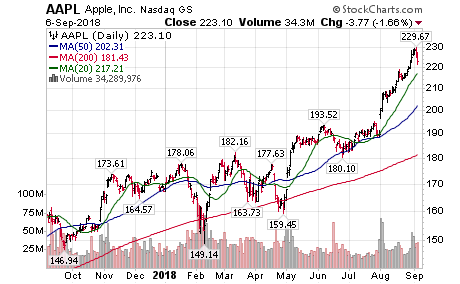 Apple slipped $0.74 to $222.36 despite Piper Jaffray’s target price increase to $250 from $218. 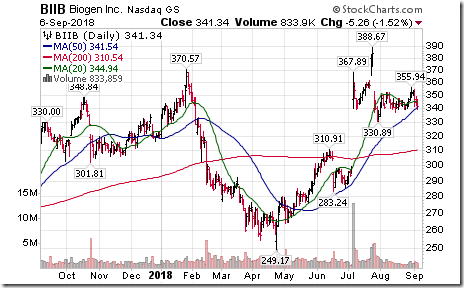 Biogen (BIIB $341.34) is expected to open lower following release of results of trials on its Alzeimer’s drug. 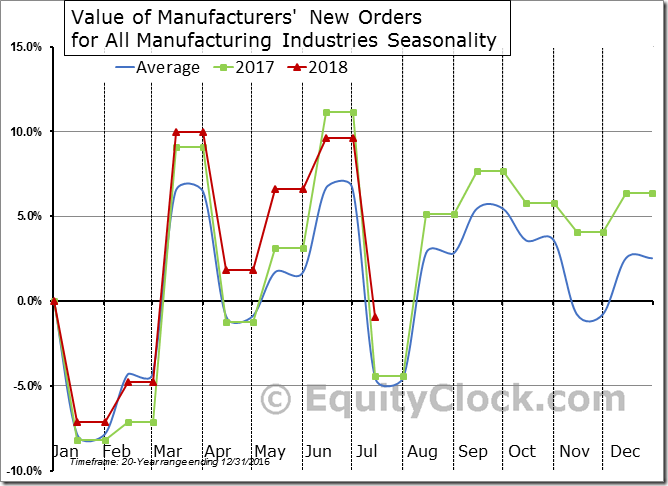 Note seasonality charts on the U.S. Energy sector, Crude Oil Days of Supply, Gasoline Days of Supply and Manufacturing New Orders. 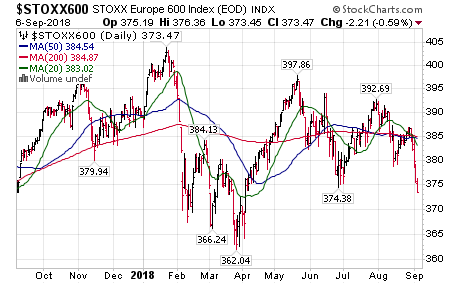 European equities and related indices/ ETFs resumed an intermediate downtrend. The Stoxx 600 Index moved below 374.38. 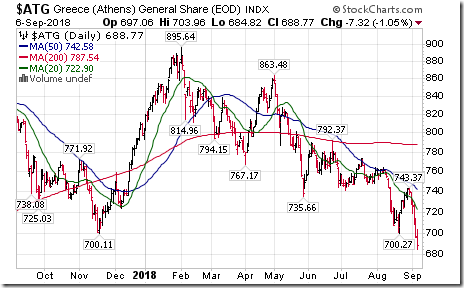 Weakness was led by another drop in the Greece’s equity index, down 23.1% from its high in February. 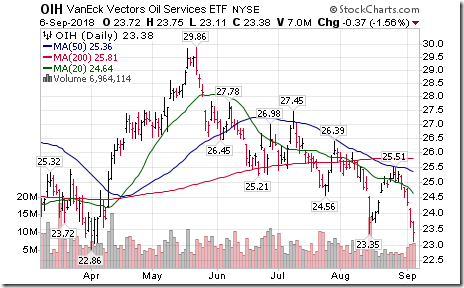 Weakest North American sub-sector yesterday was Oil Services. The commodity sensitive Australian equity market was notably weaker yesterday, joining the commodity sensitive Canadian equity market. 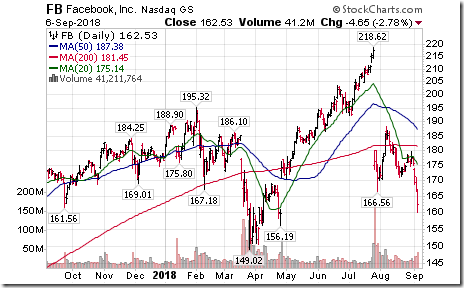 Facebook $FB, one of the FAANG stocks moved below $164.56 extending an intermediate downtrend. 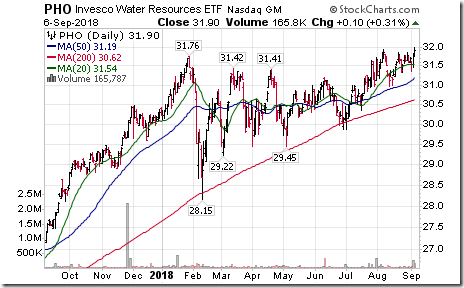 Water Resource ETF $PHO moved above $31.94 to an all-time high extending an intermediate uptrend. 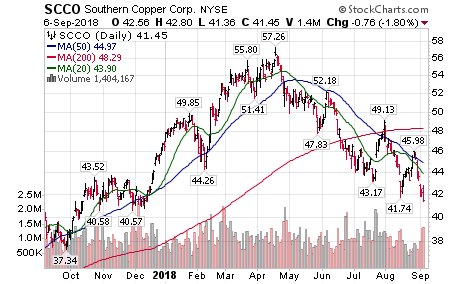 Another base metal stock breakdown! 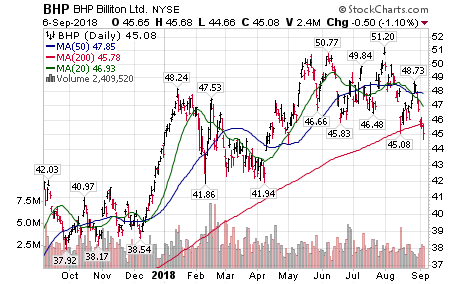 BHP Billiton $BHP moved below $46.33 extending an intermediate downtrend. 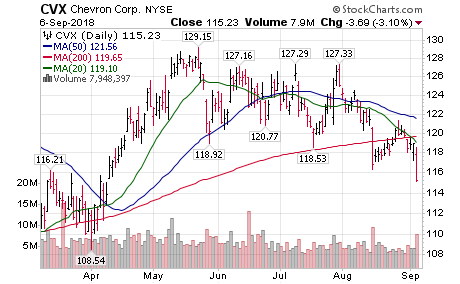 Chevron $CVX, a Dow Jones Industrial stock moved below $116.31 extending an intermediate downtrend. 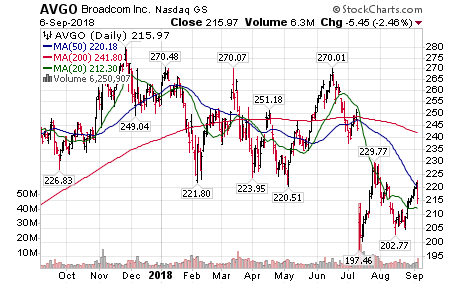 Technical action by S&P 500 stocks between10:00 and Noon: Increasingly bearish Intermediate breakdowns: $NWS $MGM $ETFC $IPGP $CVX $SCHW $KLAC $MU. The Barometer dropped 1.40 to 68.40 yesterday. It remains intermediate overbought and continues to show early signs of rolling over. The Barometer slipped another 1.00 to 36.55 yesterday. It remains intermediate oversold and continues to trend down. Join me at The MoneyShow Toronto, September 14-15, 2018, at the Metro Toronto Convention Centre, where you can meet face-to-face with North America’s leading market experts and get answers to your investing and trading questions. 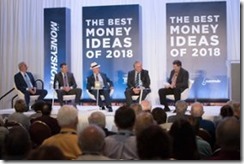 The MoneyShow is committed to providing you with one-stop, personal access to 50+ world-renowned experts in the investment and trading industry. The Show will provide you with non-commercial insights and specific recommendations that will help you create your 2018-2019 investment plan to profit. 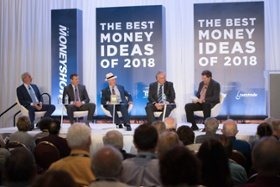 When you attend The MoneyShow in Toronto you’ll hear top experts’ opinions on global markets and the economy; cannabis and cryptocurrencies, stocks, income, and bonds; ETFs, commodities, options, and trading during the 60+ presentations, interactive workshops, live trading demonstrations, and exciting panel discussions. Don’t miss out! 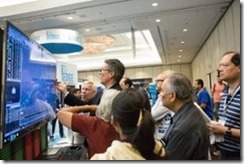 Your free registration will provide you access to a plethora of quality presentations, workshops, panels, and special events, covering a wide variety of the latest investing and trading topics, trends, and projections. Experience the interactive Exhibit Hall, where you can meet representatives from 50+ global financial service companies! Test-drive and experience the latest in tools, products, and services available to investors and traders to reach your portfolio goals. 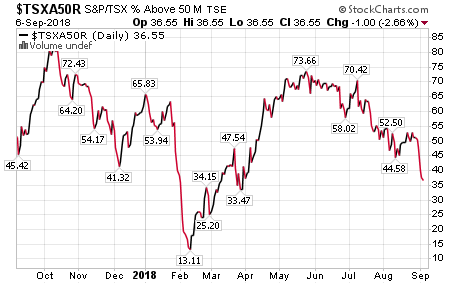 These renowned market experts can help you anticipate the market reaction to the rising US interest rates, and the potential effect on the loonie and the Canadian economy. 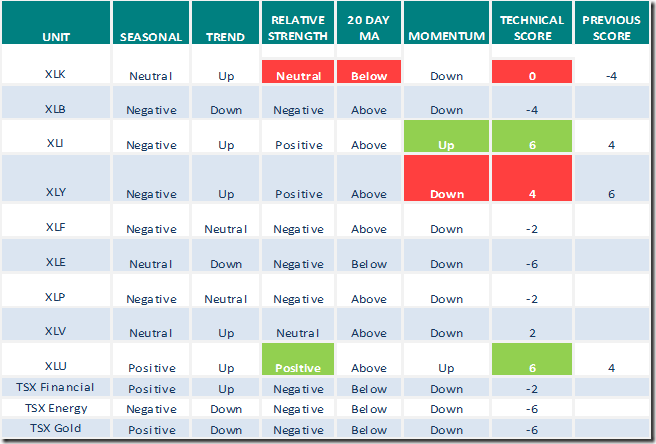 Analyze the current market environment and determine the hot spots for potential investment opportunities, while discerning the possible long-term consequences of geopolitical turmoil around the globe. 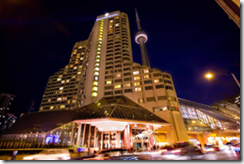 Attendees of The MoneyShow Toronto can stay at the 4-diamond InterContinental® Toronto Centre Hotel. 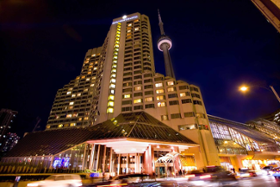 This contemporary hotel offers the perfect combination of luxury accommodations and convenience, in the heart of the city, just steps from many popular attractions, and only an elevator ride away from the conference. 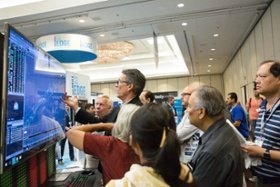 The MoneyShow Toronto, September 14-15, 2018, will be your all-in-one resource for the most comprehensive investment and trading education, providing you with the knowledge you need to trade with confidence and invest for maximum profit! 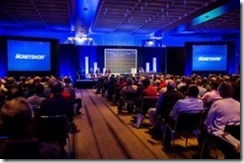 Are you going to The Money Show in Toronto Sept 14th & 15th on a fact finding mission? The $TNX weekly and monthly charts you posted yesterday were very insightful – great charting! I having been meaning to respond, but life got in the way until now. It is difficult to fathom a drop in interest rates with the US unemployment at less than 4% and the economy firing on all cylinders. But, I suppose that is the type of thinking that gets everyone to one side of the boat. 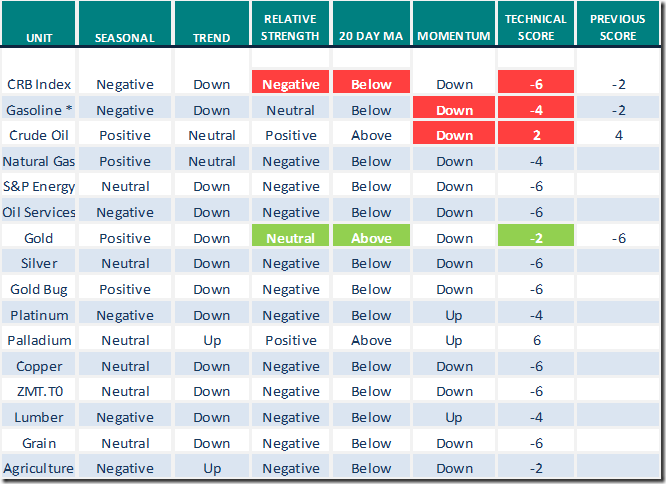 And on the other hand, this is September – historically the worst month of the year for the markets (especially the second half of the month). Maybe it is good time for people to be as quick to sell as they were to buy. I agree. 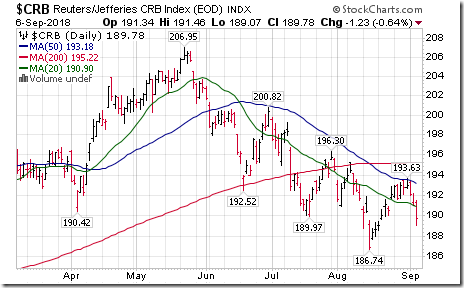 I find it hard to believe the U.S.10 year yield could soon start falling for a year or so either. But I’ve learned in the past to believe the charts rather than the talk long ago. A financial letter writer I used to subscribe to long ago once said, “If it’s obvious,it’s obviously wrong.” I always keep that in mind. 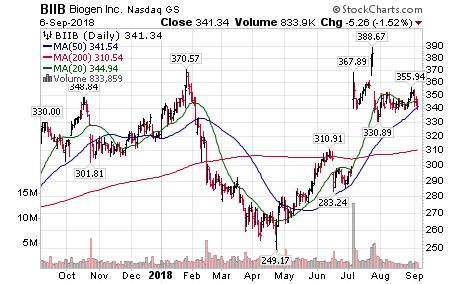 The regular 30 year price chart is still in its long term downtrend and bumping up against 3%. And that’s after 10 years of a bull market. One has to wonder about that. And the long term chart below to is a warning a pullback is highly likely. But we’ll soon see which way it moves. Right now the difference between the 2yr rate and 10 year rate is .23 and in Canada the same rate difference is .18. So both are very, very close to inverting. So it certainly isn’t a sign of economic strength for sure. And the 10 year rate isn’t the Fed Funds rate as well which is a very different rate. 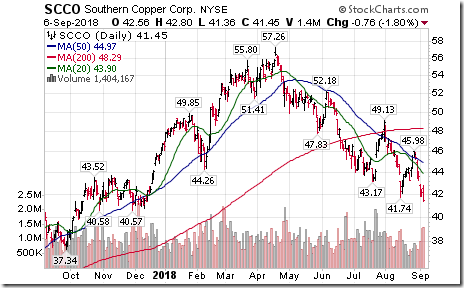 And look at Copper and other base metals. Looking at those charts it’s hard to believe there is a bull market. I think all that quantitative easing starting in 2008 has screwed up the markets so bad it will never unravel correctly. 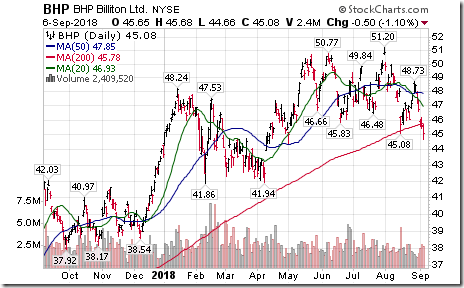 Did you see the XLU chart posted by Don above? I remember awhile back, you seemed to be following it. 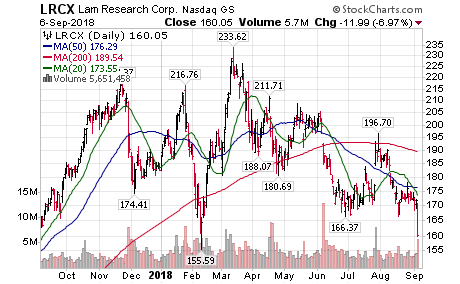 I think the move it has had is related to the fall off in U.S.interest rates over the summer and this relates to your discussion with FishFat. Do you have comments? 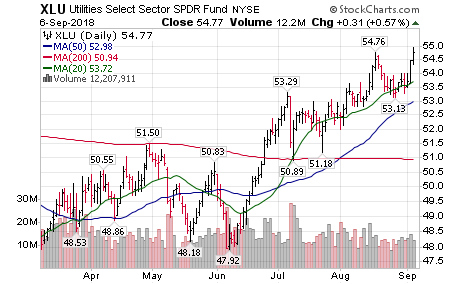 On a longer term chart XLU is just approaching a double top,being the Dec/17 high of $55.77. 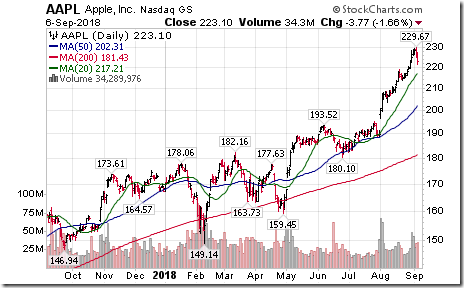 That would have to be cleared and held for a valid breakout to suggest higher prices ahead. 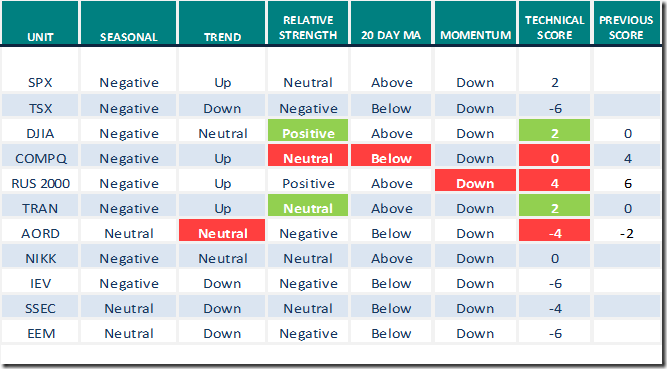 (Similar pattern with LNT. 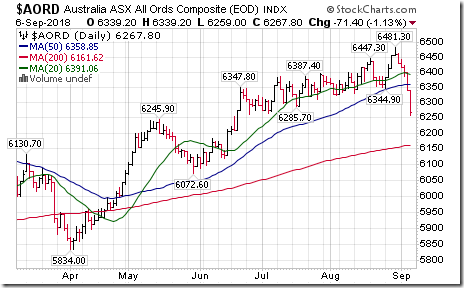 But NEE has been in a steady uptrend and is just breaking out to new highs.) And TLT has been consolidating for 2 years now in a triangle. 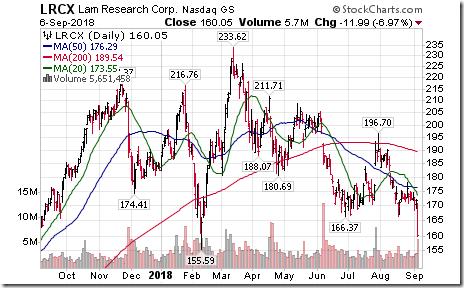 A break above $122 would suggest a run up to $126. 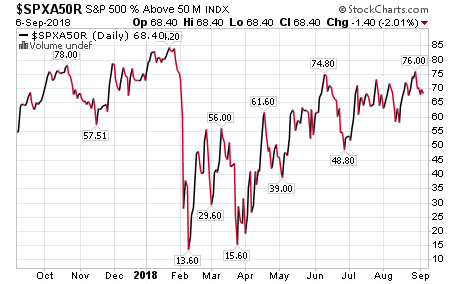 Every hot shot out there keeps saying short term rates are going higher and perhaps that’s true but the trend of the major rates don’t suggest that. I’m not an interest rate analyst so don’t fully understand the relationship of them all to each other. Wish I had studied that long ago but then when the head guy at Pimco which is the largest Bond market broker in the world was wrong on rates for years and was finally fired I have to wonder what’s the point of being an expert in any of the fundamentals that don’t work anymore. I still believe all the quantitative easing with 60 billion a month pouring into the markets for ages screwed the financial markets up to extreme and will never be fixed with an end result of being ‘normal’ again. Only thing that’s real is the charts. Can’t hide those footprints. Nope, I’m in BC so no travelling for me 🙂 Too busy working and trying to save for retirement! 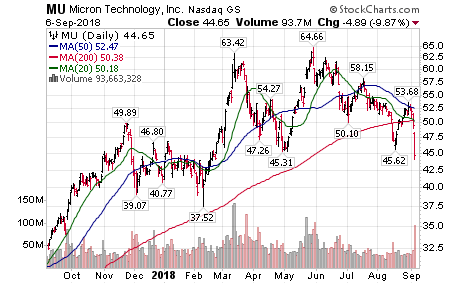 Thanks for your comments and charts. I thought you might have something to say on the subject that would be very informative. 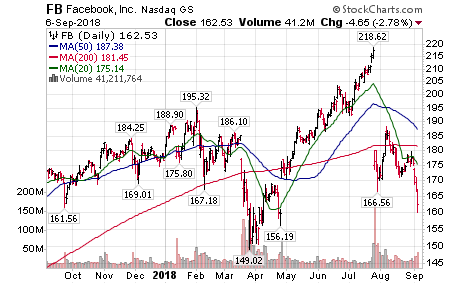 Yes, it is all in the charts but we humans can’t help but try to understand “why” things are the way they are and figure out whether there is a change coming. I guess the PIMCO guy was stubborn and so convinced he was right, that he could not accept the reality of the charts. Maybe the quantitative easing affects will be worked out of the system eventually but who knows how long it will take and whether there will still be unforeseen consequences. 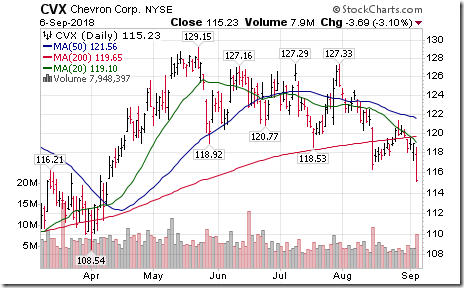 It looked like a possible break out of the triangle to the upside this summer by TLT but then it fell back in. Will it go down to test the bottom? That is possible, and then rates would indeed be headed up for a bit until resistance (on rates). But sooner or later, TLT will beak out of the triangle for real, one way or the other. If it breaks out to the upside, and rates goes back down, the stock market will go down also. Maybe this will be the correction we have been waiting for. 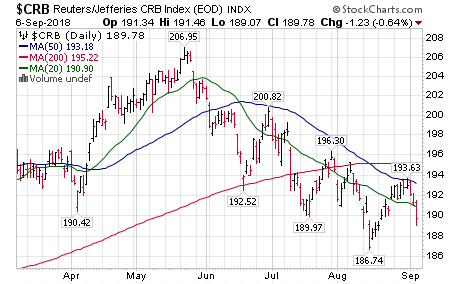 Here is a chart of EIF (7 -10 Year Bond) and overlaid is the TLT and for added pleasure the XLU. 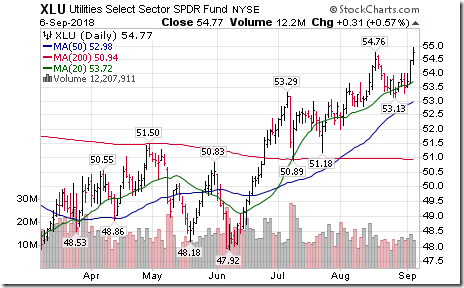 It looks like the XLU which is a bunch of Utility stocks is leading the actual bonds. 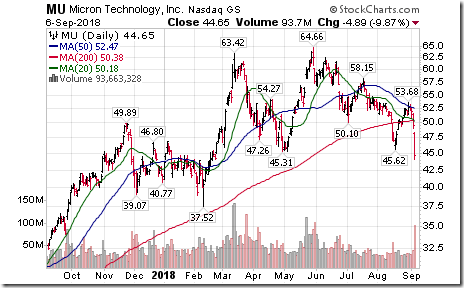 “IF” I was a Bond expert like I was told to focus on in the 70’s and never did I’d likely have a better idea of what this chart is saying for sure. In my next life I will spend the necessary time on the Bond market. 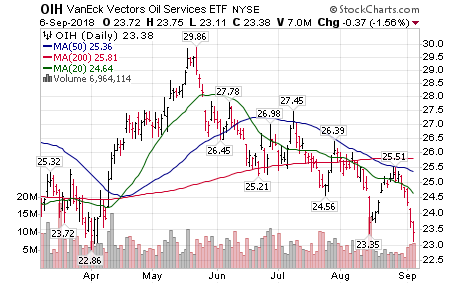 Correction: #8 should read: a chart of IEF………..Not EIF.